Umbrella Tree at Radio 1 Big Weekend. New Blog! Umbrella Tree at Radio 1’s Big Weekend. We supplied the umbrellas for the Umbrella Tree installation at Radio 1’s Big Weekend! 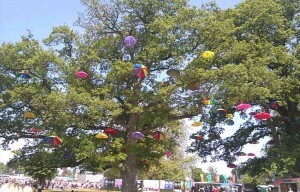 Umbrellas were hung from two trees at Powderham Castle in Exeter. Creating a whimsical display above the heads of music fans. An effective, yet easy way to create eye catching illusions that people will snap pics of and post to their social media. As a matter of fact, display styles like this are being used by Commercial Decorations Specialists around the world. With Umbrella art going up above shopping streets in Dublin, Dubai, Liverpool and Italy not to mention, Portugal and London. Of course, we are grateful to Jon McMullan of Made Up Ltd, for the photograph. Click here to visit our range of 1000+ unique umbrellas!